While doing activities (hunting, gathering, excavating or traveling) your Kukuri has a small chance of meeting an illness or injury with varying level of debuffs. Items are required to be on your bank account, before usage! REPLY TO THIS COMMENT THREAD TO HEAL YOUR KUKURI! Healing item/s are required to be in your bank account when posting the healing request. What did Hippu do to deserve a scar? 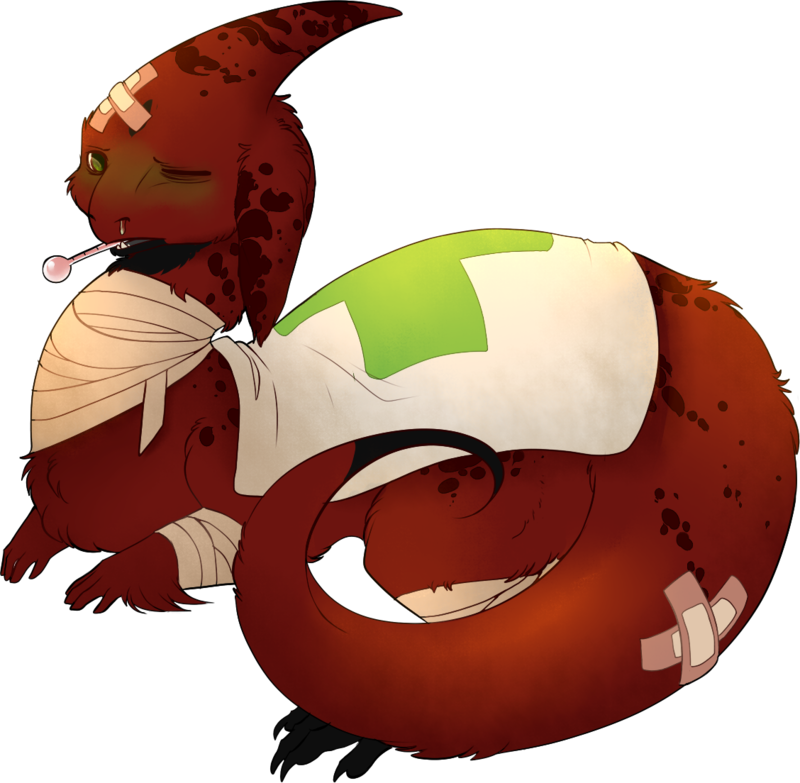 Most might say it was a mere scratch but nevertheless the kukuri bandaged it up, in fear of it to be left on her body. Soon the scar was gone! Peter discovered a new cave but to his bad luck it was full of small inhabitants called fleas! The rook got caught by them but with the power of the bitter medicine the little critters got beaten up! Adokas' adventures went a bit too far as the kukuri visited colder lands. The ears got infected and every sound dulled out. Unhappy about it, Adokas took the bitter antibiotics and got better pretty fast! Haapa traveled to lots of exotic places but the kukuri himself got some tourists on his back! Nasty fleas who didn't pay for the attractions at the fur and skin land. Showing them who owns the place, Haapa took the medicine and the upset fleas left. It seems there is no medicine in your bank account but a healing potion! You can purchase the medicine through the shop and repost it back in line. Illness/injury you're healing: Fleas ! Sadly we cannot heal your kukuri as the feature of purchasing medicine inside the healing thread got taken away. The items have to be in your bank account before you can heal your kukuri. Cupid felt awful getting a small scar. But the scar was just a mere scratch and as soon as bandages were applied, it vanished. Lum had an interesting excavating trip but caught a nasty horn infection! Without any hesitation, the prairie rook took the antibiotics like a pro, feeling all better soon! The eye infection was quite bothersome to Zigzag. Even if the hunting trip was fun, the kukuri had to take the antibiotics. Soon Zigzag was all healthy again! Khaliq gagged as she took the gross antidote. Within a few hours, the symptoms vanished and with them the blue mushrooms. Czar was beaten by the contamination but with the help of his companions he got his paws on the antidote. Soon the shrooms vanished and with them the nasty contamination. You can buy the item straight with this form without having to make a stop in the shop, if you so desire. THIS COMMENT THREAD IS RETIRED! Charlie had enough of the contamination and took the bitter antidote. After swallowing, the kukuri felt much better and it didn't take long for the shrooms to vanish from her body. The infection had Warlord in its grip, but the antidote was stronger. Soon the shrooms vanished and what was left was a healthy kukuri! The large prairie rook took the antidote before the contamination consumed him whole. Soon the shrooms toppled off and the kukuri was freed from the nasty pest! Flick's expression was disgusted after swallowing such horrible bitter antibiotics. Although they helped fast, it was an experience the kukuri wished to never have again! Sath didn't have it easy as the kukuri drank the bitter potion. The bitter taste distracted Sath as she got the stitches applied. They hurt, but it was necessary to get fully healed and she did! It was flu season and it got poor Bongo too! To go back to adventures, the rook took the bitter medicine without hesitation. Do it for the travels! And soon the flu went away with no further notice. Seti took a deep breath as the kukuri struggled applying the bandages. Even if it wasn't a masterwork, the bandages healed the small scar over little time! Korpi had bad luck while traveling and caught a nasty ear infection! To get rid of the scratchy feeling, the kukuri swallowed the antibiotics without any water! With luck, Korpi's infection went away pretty fast! The shroomified kukuri took the nasty tasting antidote only to see how the blur in his sight lifted. Flux soon was healed and only the memory from the shrooms was left in his mind. It was the year of regular poisonings while kukuri travelled and Buddy got hit too with it. After drinking the nasty medicine, Buddy felt a lot better, marking a big red X on the spot where he got poisoned; to avoid future health risks. Angelica had enough with being poisoned and drank the bitter medicine. After being back to her usual self, Angelica promised to herself to never travel to that one place ever again. Gosh, being poisoned isn't fun! Heal Kukuri of Injury/IllnessWhile doing activities (hunting, gathering, excavating or traveling) your Kukuri has a small chance of meeting an illness or injury with varying level of debuffs.